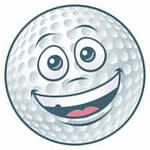 Home » General Interest » Golf Condumdrums – Why does a course have 18 holes; Why does a golf ball have dimples ? 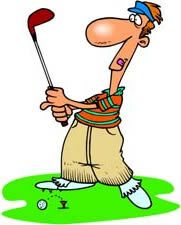 Golf is one of those games that is often seen as rather elitist. It certainly has it’s own, language and nomenclature ; eagles, birdies, over-par; under-par the list goes on. In this article we try to answer some of the questions surrounding this rather odd sport. In Scotland, the home of golf, courses were originally designed with varying numbers of holes, depending on how much land was available. 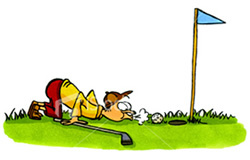 Some golf courses, according to United States Golf Association Librarian Janet Seagle, had as few as five holes. The most prestigious Scottish golf club, the Royal and Ancient Golf Club of St Andrews, originally had 22 holes. On 4 October 1764, the course was reduced to 18 holes in order to lengthen each fairway and make play more challenging. As a desire to codify the game grew, 18 holes was adopted as the standard after the St Andrews model. Why do golfers yell ‘fore’ when warning of an errant shot? Because dimples are cute? No. We should have known better than to think that golfers, who are known to wear orange trousers, would worry about appearances. Dimples provide greater aerodynamic lift and consistency of flight than a smooth ball. Jacque Hetric, Director of Public Relations at Spalding, notes that the dimple pattern, regardless of where the ball is hit, provides a consistent rotation of the ball after it is struck. Janet Seagle, of the United States Golf Association, says that other types of patterned covers were also used at one time. One was called a ‘mesh’, another the ‘bramble’. Although all three were once commercially available, ‘the superiority of the dimpled cover in flight made it the dominant cover design’ Although golfers love to feign that they are interested in accuracy, they lust after power: d.mpled golf balls travel farther as well as straighter than smooth balls. Those cute dimples will stay in place until somebody finds something better.